This is what Thoreau, suffering from tuberculosis and chained to his own deathbed in 1860, responded to a friend who tentatively made a reference to a life after death. Thoreau might not have been sure of what was coming after his demise — but he was not willing to waste even a second of the one thing he knew he had for sure: Now. Sometimes, it feels like Now is unbearably long. Infinite! Especially for people who are waiting. Waiting for the line to move. Waiting for that red light to turn green. Waiting for that child to be born. And in my case, as my post Transit. already describes: waiting for companies to make up their minds about whether or not they will offer me a job after I have finished my thesis. Waiting for words to fill pages. Waiting for times to magically change and hearts to feel lighter. When you are waiting with impatience, what you want is for the Now to turn into Tomorrow. And this is, in fact, a form of aversion, as Jan Chozen Bays explains in her book How to Train a Wild Elephant. This is so because we are giving into the thought that, if only this and that could already be over and done with, then everything would be so much better. In essence, this results into an outright rejection of the present moment and everything that is tied to it. I am currently entangled in a long-term, energy-depriving job hunt in an era where literally hundreds of applicants are lining up for the job I want; we are all jumping through burning hoops, smilingly showing how endlessly flexible we are, how amazingly positive, how we love being “challenged,” how this is but a mere breeze in our daily exercise of bending over backwards. In Who is the Feminist Now? I wrote about how this makes me feel. In short, I want to know that my studies, and the thousands upon thousands of dollars and part-time job hours and brain cells and sweat pearls I single-handedly poured into them were worth it. That there is a spot out there for me where I can use my talents and possibly even help someone out. I want to know that my emotional and financial investment is going to pay off; I don’t want to be rich, but I would appreciate some sort of security. Yet today, I got a call from another job opening for which I have had two interviews followed by an entire “test day” on which I have had to fulfill four challenges and present my results in a power point presentation. It turns out they would have liked to hire me; however, right now, they are unsure of whether or not they will at all be able to fill the position and will let me know at some point in the future — by the end of next week, next month, who knows, they said. They simply cannot say, and they are deeply sorry. This was the last of applications I had sent out. The last reply I had been waiting for. Now the process of everything will start all over again. I want to know that everything will be fine. That I won’t be a burden. It is hard to trust that after this world there will be another world. That after this phase there will be another. And a good one at that. That, after I am done with this part of my life, I won’t be falling, falling endlessly into the dark abyss of nothingness. We want to know whether we’ll be okay. Whether we are going to be fine. Even on our deathbeds, or perhaps especially on our deathbeds, we are wondering: what awaits us? And more importantly: will we be able to bear it? The hard truth is: until we figure out the issue of time travel, we’ll just have to settle with the present. The present is going to be here, whether we want it or not. Whether we want for it to go fast or slow, it’ll be what it is. So, ultimately, I suddenly found myself pondering today after I got the mediocre news. Yes, I want the Now to go by. But. Would everything really be so much better if it did? Or, to perhaps put it differently: is Now really so bad? Is it? Does it truly deserve the aversion I feel for it? Here is my little red yoga mat with the yellow flowers. There is a fridge overflowing with nourishing food. Here is my husband, safely returned form a day’s worth of work and a bike ride through rush hour traffic. Here is my friends on my messenger, all of whom got enraged about the job news; they feel with me. Here is my grandmother, who says to go and buy a bottle of wine and she’ll send me the money (yes, she is one of a kind). Here is my plants and my thesis and my loan of which there is still enough left for me to scrape by a couple of months. And after that, if worst comes to worst, I have a system to support me. But I don’t even have to worry about that. Because all I have right now is Now. The rest is not real. None of the future scenarios are realities. This is reality. And now, I am completely fine. And I bet that, if you honestly cut it down to this exact present moment, most of you are, too. 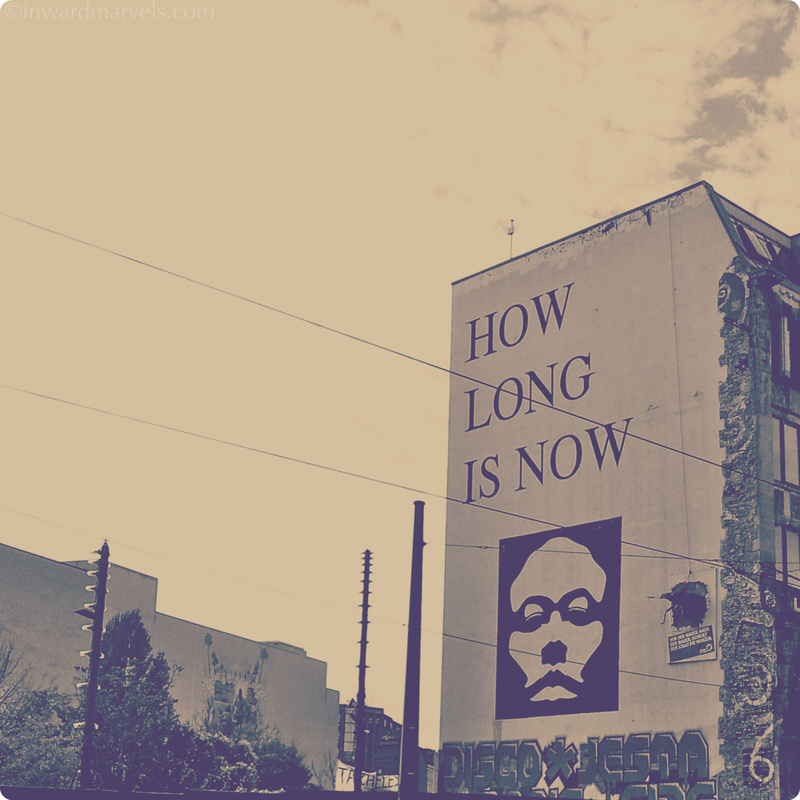 How long is Now? I guess that is something everyone decides for themselves. Well first of all: Now it got me curious about what things you realized! And secondly: THANK YOU <3 How lovely, can't wait to check it out tomorrow :D have a good night sleep my dear!